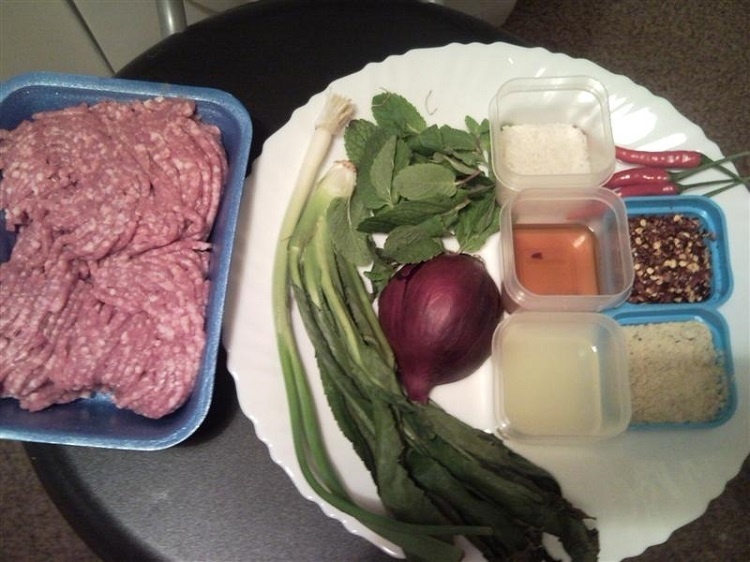 Laab moo, or spicy pork salad, is a spicy issan favourite. Popular all over Thailand, it is usually eaten with sticky rice or other issan favourites such as som tam. Although called a salad, there isn’t much “green” stuff in it. 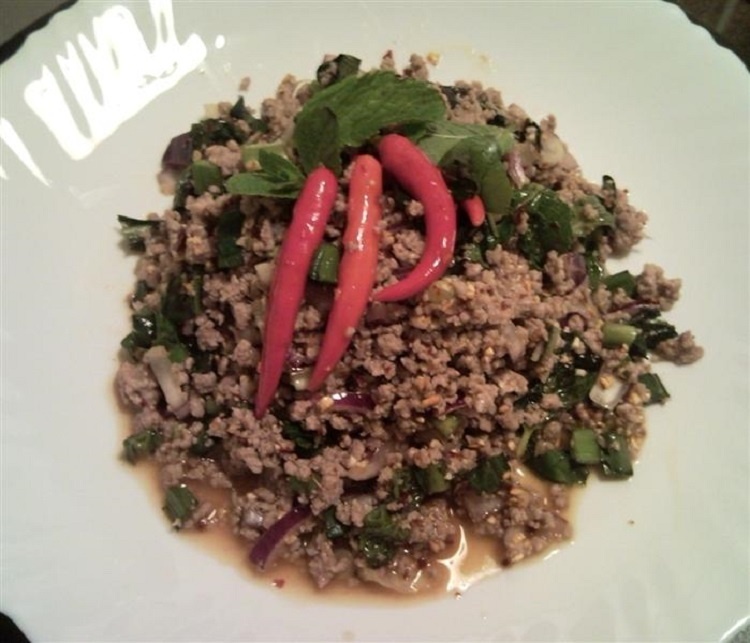 In this recipe I have used minced pork, but you could use minced chicken or beef. This recipe is supposed to be spicy, so don’t be shy with the chillies! Step 6: Heat a pan, and pour in the minced pork. Stir thoroughly until the pork has cooked, but be sure not to over cook it. It should have a white-grey colour. When it’s nearly cooked, add the stock granules. 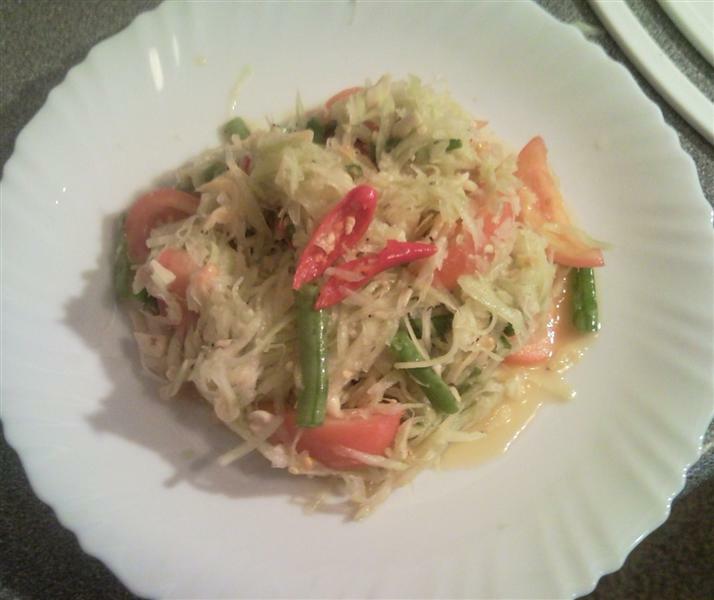 Som Tam is a spicy Thai salad made from papaya. The papaya should be unripened and white inside. The dish combines 4 tastes – spice from the chillie, sweetness from the sugar, salt from the fish sauce, and sour from the lime. This spicy papaya salad is a great snack, or side dish. Again its very healthy and meat free. 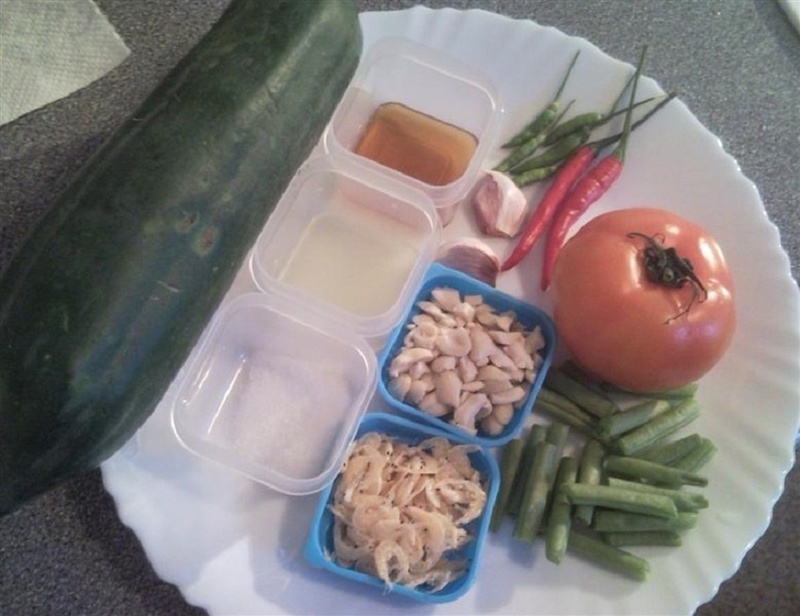 Its usual in thailand for the customer to choose and add the ingredients themselves to suit their tastes, so why not play around the type and quantity of ingredients listed below until you find your ideal combination. This dish is very quick to prepare, although it can be tricky finding the raw papaya. Step 5: If you dont have a mortar and pestle, use a spoon to mix everything, and make sure you crush the chillis to get the spice released. Do the same with all the ingredients. 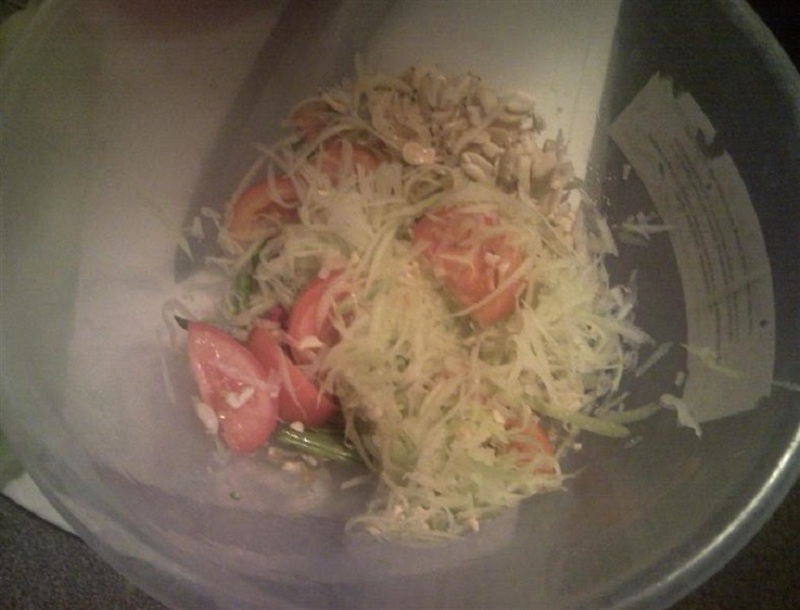 Step 6: Once everything has been thoroughly mixed, you can serve and eat. 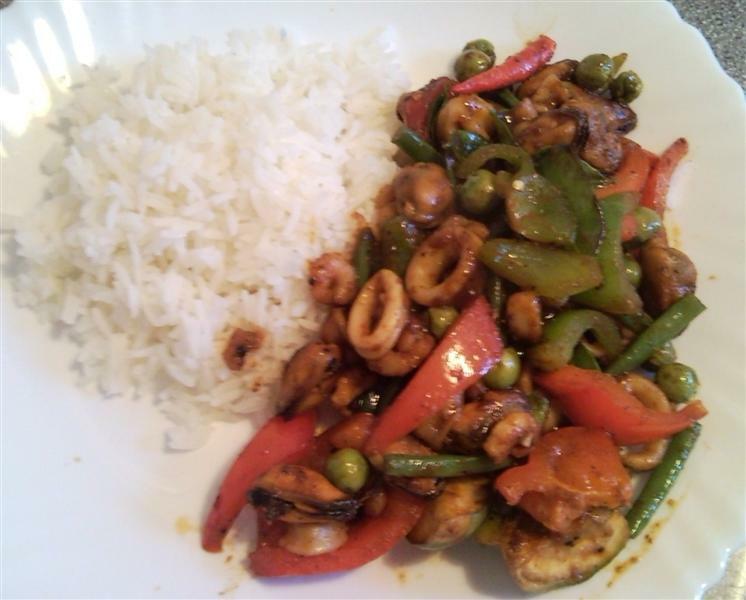 Thai chilli paste stir fry with seafood mix is a very hot and spicy dish. The lime leaves and lemon juice work together to give it a distinctly sour tang. In this recipe we have used a seafood mix, but you can also use pork, chicken, beef, or tofu. Best served with Thai jasmine rice, this is a great recipe for those who like spicy stir fries with sharp flavours. 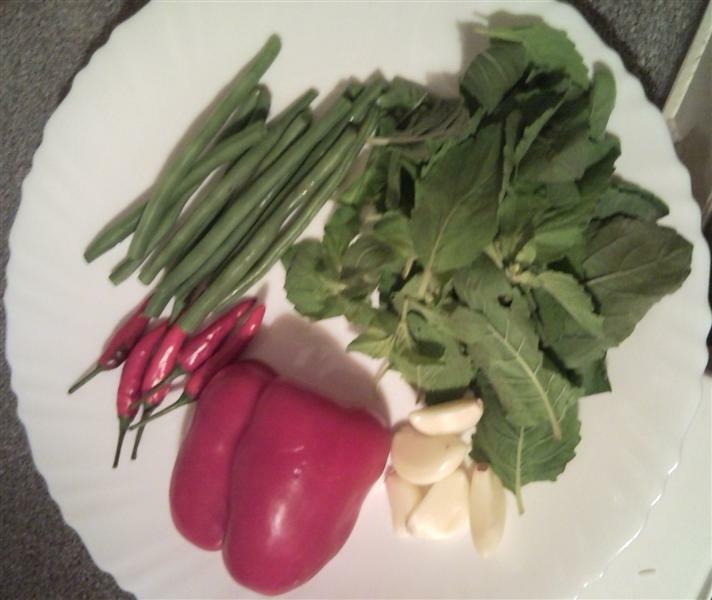 As with most Thai recipes, the ingredients below can be adjusted depending on your tastes – particularly when it comes to the amount of chillies added. Step 1: Cut the green string beans. 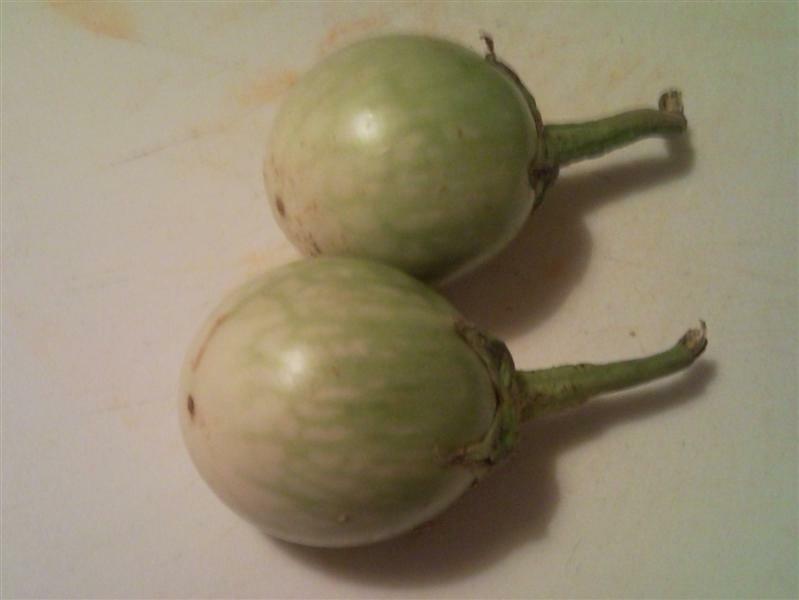 Tear the storks off the baby egg plant and young egg plant, and was them thoroughly. 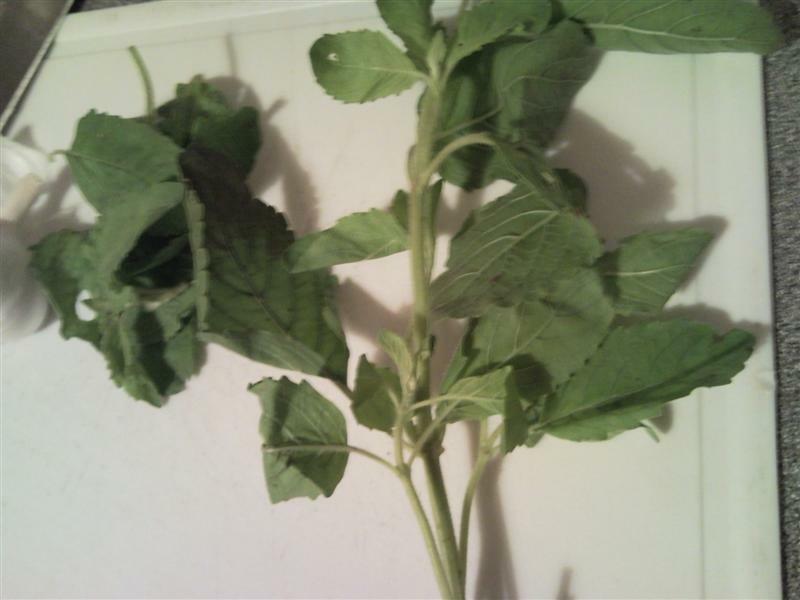 Step 2: Chop the young egg plant into quarters. Slice the peppers. Step 3: Remove the chilli storks, and cut them open as shown in video. Wash the peppers. 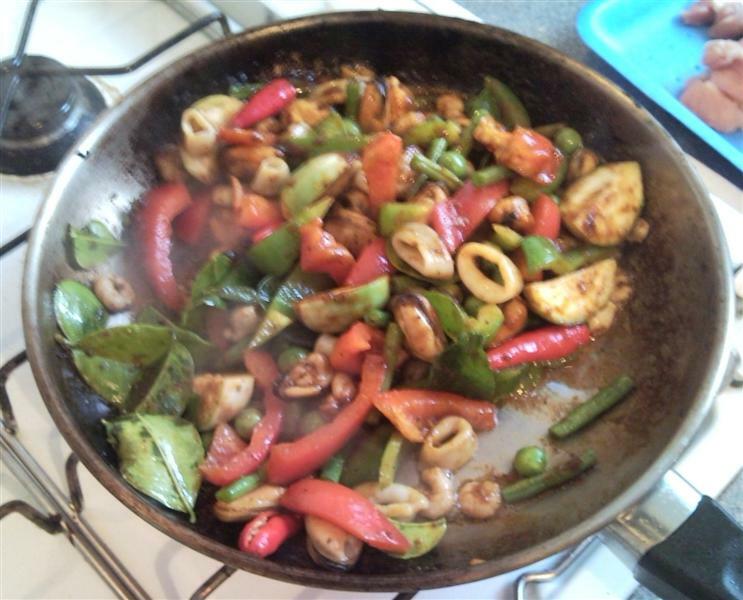 Step 4: Put 2 teaspoons of vegetable oil into a wok or pan, and set your cooker to a high heat. When the wok is hot, put in 2 tablespoons of chilli paste. Mix the vegetable oil and chilli paste together. 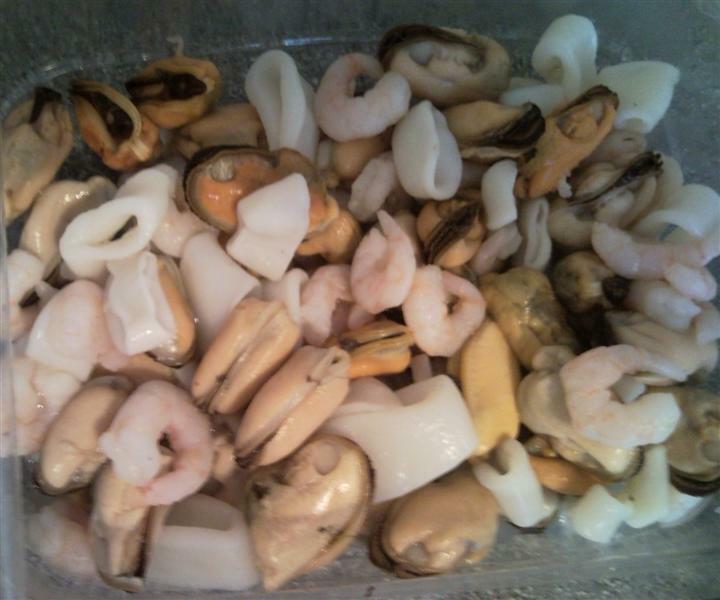 When the paste is sizzling, put in the seafood mix and stir contents together. 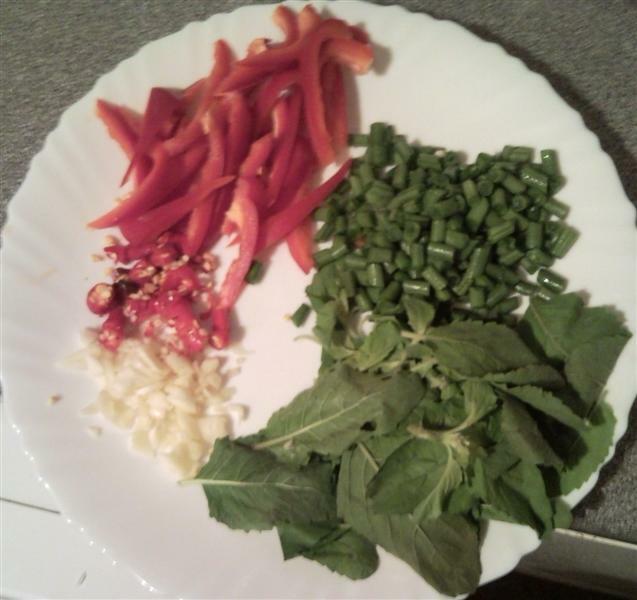 Step 5: Once the seafood mix has been coated with the chilli paste, pour in the chopped peppers, chopped young egg plant, chopped green string beans, baby eggplant, whole chillies, and lime leaves. Mix everything in the pan together, keep stirring thoroughly. Once mixed, lower the heat. Step 6: Use a fish slice to squash the chillies in the pan to really release their spicy flavour into the pan. Step 7: Now add 1 tablespoon of fish sauce, and 1/2 tablespoon of lemon juice. Keep stirring. By now the ingredients should have been cooking for about 5 – 10 minutes on a high heat, and a further 5 minutes on a lower heat. Once everything is cooked, serve, ideally with Thai jasmine rice. 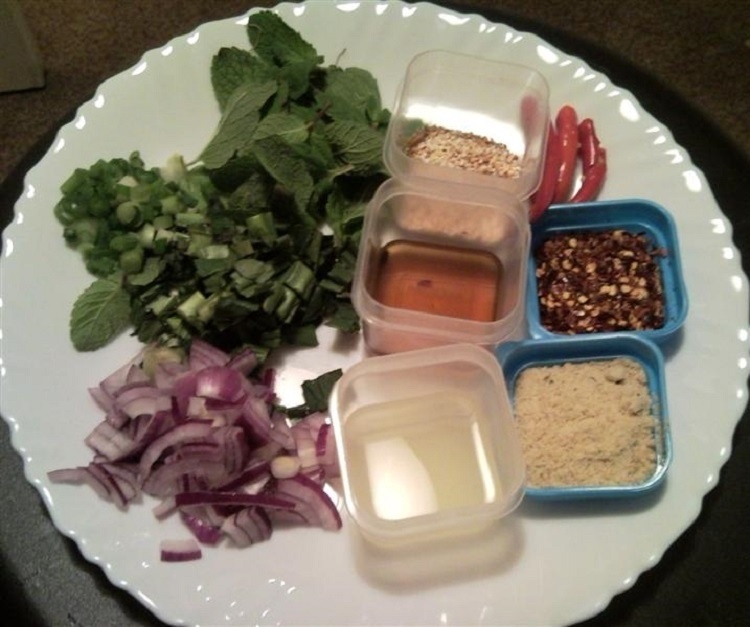 This spicy stir fry recipe is common throughout Thailand. Bulked with rice and topped with a fried egg, it is a delicious tasting, cheap, easy to prepare and filling meal. 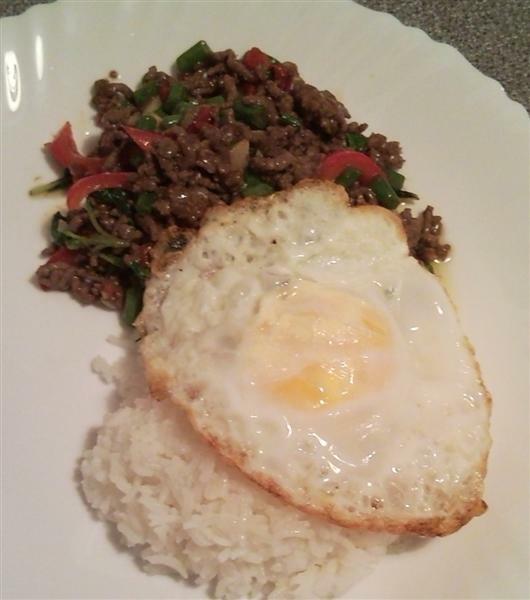 Spicy and meaty, pretty much every visitor to Thailand is sure to have tried and enjoyed this recipe. Usually served with minced pork, however I have used minced beef. You can also use minced chicken. The egg is optional, but I find it goes well with the dish as a whole. Basil and salt to taste. Open pita bread in half and toast both sides on a grill, book. In the same grill or iron hot place the sliced eggplant without skin, previously washed zucchini and slice with your skin, onion slices and drizzle with olive oil. Turn when golden brown and leave there until the other side. 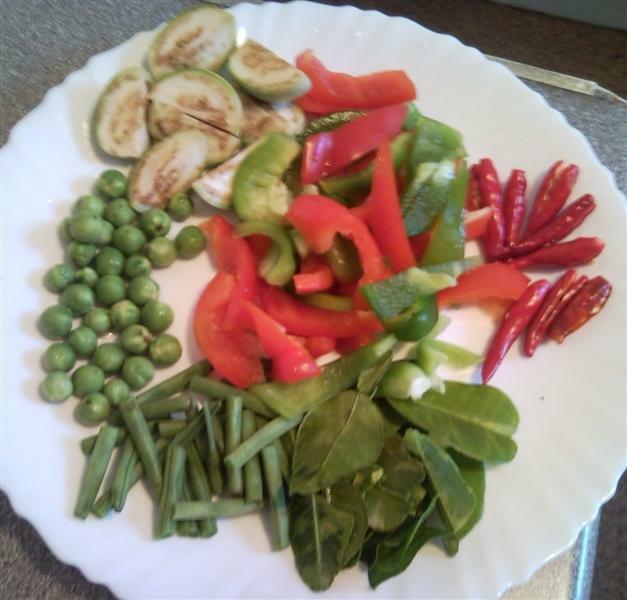 Place vegetables over cubes of cheese mozzarella and when the cast carries this on one of the halves of pita bread with all the vegetables cooked on the grill. Add the tomato slices previously washed, sprinkle with oregano and basil, salt if desired and cover the sandwich the other half of the pita. 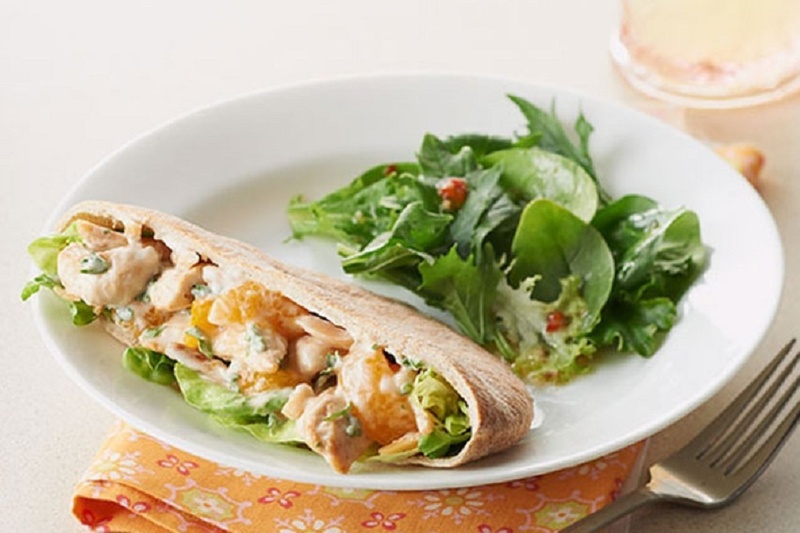 This recipe for grilled vegetable pita is an excellent preparation and the main course is suitable for vegetarians and also, to carry on tupper while eating healthy. It is a rich dish fiber, Vitamins and minerals and above all, full of flavor, as all the vegetables, along with olive oil and dried herbs provide an appetizing dish. The vegetable pita also offers healthy fat derived from olive oil Antioxidants and protein resulting from the quality of the cheese. Furthermore, although in this case, the bread is white bread, vegetables reduce their absorption, reducing the glycemic index of food and offers more fullness. What Is the Best Pasta Maker Brand? Pasta Maker for Homemade Pasta – Fast and Easy! How to clean a pasta maker? How to Eat Pasta and Still Lose Weight?